sea fishing, and after a quick walk around the harbour you’ll see why. The main part of the quayside is devoted to moorings for local and visiting fishing craft of all types and sizes, from prawn boats to deep-sea trawlers. Further upriver the local marina is jam-packed with all manner of vessels varying from charter fishing boats to privately-owned yachts. During the summer the pier is lined with youngsters hauling in a variety of flatties and other small fish, using a wide selection of vintage and modern tackle. The town retains its strong connections with the sea and celebrates by holding an annual Sea Fayre Week with many festivities centred around the harbour. The town has a good range of holiday accommodation with lots of B&Bs, a caravan site plus hotels nearby, making this an ideal spot around which to base a family holiday. The pier is a tremendously versatile fishing mark that has very recently undergone extensive refurbishment. In other words it’s now dead posh. The full length of the pier is in tiptop condition with seating every few yards and the renewed railings make it both safe and comfortable. During the summer months flounders and coalfish are the main quarry with the usual ragworm and mackerel baits very effective. This year, anglers spinning for mackerel also took quite a few herring which seem to be making a comeback at the moment. In the colder months, when the sea is very rough, good numbers of codling are taken, with ragworm again proving just as deadly as more sophisticated baits, such as peeler crab. The rocky skeers south of the harbour are a Mecca for local cod anglers and are capable of producing some tremendous bags of fish. The name Saltpans denotes an area where in past times locals used to collect salt deposits. Nowadays they use supermarkets to secure their salt supplies. 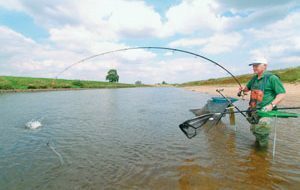 The best catches are taken when the rocks start to emerge approximately three hours before low water, gradually moving down the skeers as the tide ebbs. Cod are the main quarry although coalfish, flounders, freshwater eels and bass are taken occasionally. Peeler crab is the top bait and will outfish most other baits. The Granary pub is situated midway between Amble and Hauxley beside handy car parks giving easy access to rock edges. Most of the activity takes place two hours either side of low water with cod to double figures a real possibility. Medium-sized tides are the best option when the gullies remain full of water and a cast of 60 yards is generally sufficient to put your big peeler crab baits into the catching zone. As well as codling and coalfish, a number of big flounders are landed every season, often on a 3/0 hook. These marks often produce the winning bag of fish in the annual open competitions held along this coast. Situated adjacent to the Haven rocks, White House Sands are nothing short of brilliant if night-ime beach fishing is your passion. In the past few years between September and March the Sands have rated among the ten top beach marks in the northeast and have produced a number of 40lb bags in local club matches. 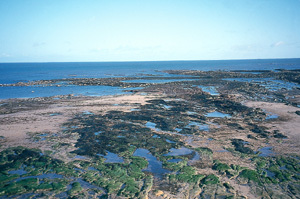 The area is made up of small sandy bays interspersed with sections of flat rocks; very similar to Whitley Bay Beach which is another of the region’s hotspots. The key factor making this area so productive, even during the heaviest of storms, is the shelter provided by Coquet Island situated a few miles offshore. Lugworm and peeler crab account for most of the fish although ragworm and various shellfish can prove deadly at different times in a season. The ‘Haven’ is in fact a maze of long, rocky sheers, intersected by deep, weedy gullies and a seemingly never-ending jungle of kelp stalks stretching out as far as the eye can see. For any cod angler worth his salt these marks offer the ultimate challenge, with the rewards a creel filled with plump, well-conditioned cod on offer. 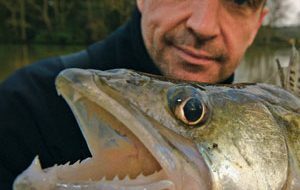 During the winter months following any good easterly blow, the gullies can produce some outstanding catches of cod with peeler crab the favourite bait. The size of tide and the state of the sea govern which sections of the rock edges become exposed and a one-metre tide is the minimum required to guarantee the bulk of the skeers are fishable. Cod are the main quarry but during the summer, ballan wrasse are plentiful with fish to 4lb possible on crab baits. This is the ideal place to head for when a big sea is running and most marks are unfishable. The Carrs are protected on both sides by a series of outer reefs and can produce some huge bags of cod on a stormy night. The rocks are exposed for approximately two hours either side of low water, although fishing time greatly depends upon the sizes of the tide. As a rule of thumb a one-metre ebb is considered perfect but great care should be taken, especially at night. The entire area is a honeycomb made up of rocky skeers and kelp beds and is a cod angler’s paradise. The most effective bait is generally fresh and frozen peeler crab followed closely by lugworm and snake whites, so take plenty with you. Check your tide tables. You’ll need to pick a large tide to ensure that the rocky skeers are exposed. Also Go for a large hook if you’re targeting the cod and flounders. These big flatties will have no problem swallowing a size 3/0.